The Canadian Rocky Mountains Parks are a group of seven national parks that are located within the Canadian Rockies. The Canadian Rocky Mountains Parks are a group of seven national parks that are located within the Canadian Rockies, declared together as one UNESCO World Heritage Site. 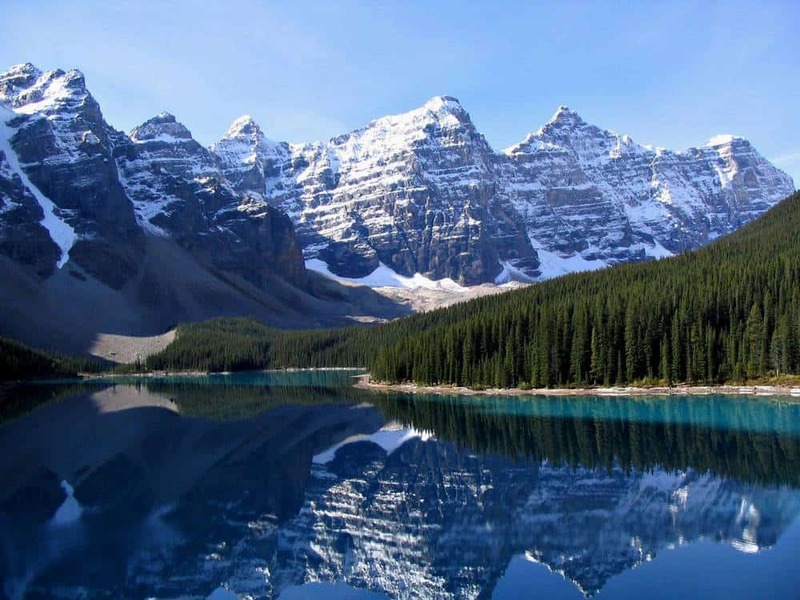 The seven parks are Banff, Jasper, Kootenay, Yoho, as well as Mount Robson, Mount Assiniboine, and Hamber. They became a UNESCO World Heritage Site in 1984. 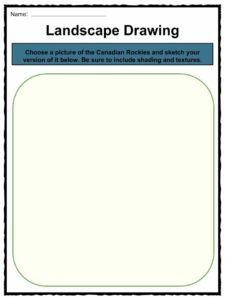 See the fact file below for more information on the Canadian Rocky Mountains Parks or alternatively, you can download our 24-page World Heritage Sites: Canadian Rocky Mountains Parks worksheet pack to utilise within the classroom or home environment. The Canadian Rockies are a part of the Canadian Cordillera, which is the name for all the mountains of Western Canada, and the sequence continues into the American Cordillera, which is a continuous sequence of mountains that run from Alaska to South America. Mount Robson (seen to the right), is the highest peak in the Canadian Rockies, at nearly 13,000 feet. 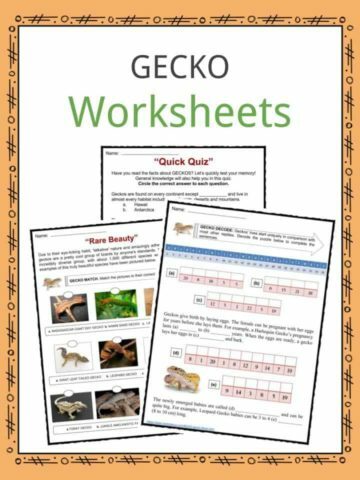 It is impressive because you can view it directly from the Yellowhead Highway, which stretches across the four western Canadian provinces. The second-highest peak is Mount Columbia, about 700 feet shorter than Mount Robson. 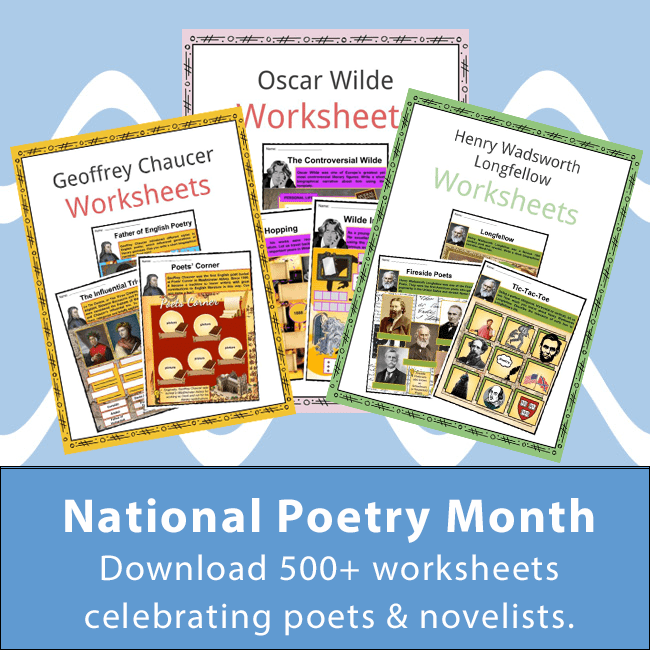 The only river that penetrates the mountain range is the Peace River. Other rivers that originate in the Canadian Rockies include the Bow River, Fraser River, Columbia River, North Saskatchewan River, and the Athabasca Rivers. The geology of the Canadian Rockies differs greatly from the geology of the American Rockies ot the south. 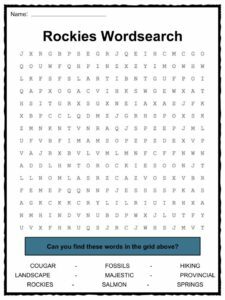 Sedimentary rock such as shale and limestone layer together to create the Canadian Rockies, whereas the American Rockies are made up of metamorphic and igneous rock, such as granite. The Canadian Rockies are more jagged due to more glaciation. They are also cooler and wetter, which results in more moist, fertile soil, larger rivers, and more glaciers. The treelines are much lower in the Canadian Rockies than they are in the American Rockies. 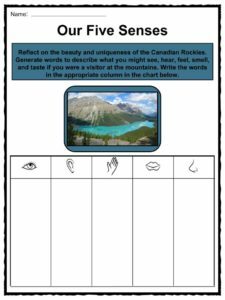 If you visit the Canadian Rockies, you’ll find icefields, valley glaciers, breathtaking lakes, canyons, alpine meadows, waterfalls, caves, and examples of erosion and deposition. While traveling in the Canadian Rockies, you are likely to experience moisture-laden winds from the Pacific Ocean. These typically dictate the weather. The higher you climb, the colder the temperature. Summer in the mountains is short, but the days are long with up to 17 hours of daylight around the end of June. January is usually the coldest month; it is not uncommon to see temperatures drop to -40 degrees fahrenheit overnight. Snow often falls up until May, and many lakes remain frozen until June; snow cover on higher parts of the mountain remains until early July. The ecology of the Canadian Rockies is diverse; you can see animals such as bighorn sheep, elk, cougars, Canadian lynx (pictured below), black bears, grizzly bears, coyotes, gray wolves, black bears, and wolverines. Aspen forests can be seen in the foothills of the Canadian Rockies, and black spruce occurs too (pictured right). Many species of ducks and geese can be found swimming in the wetlands of the Rockies, as well as several bird species. 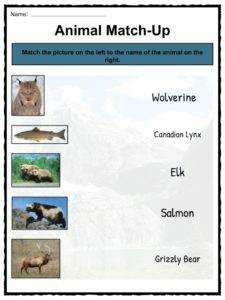 Coldwater fish, such as trout and salmon, can be found in large quantities in the Canadian Rockies, and are a source of food for bears. 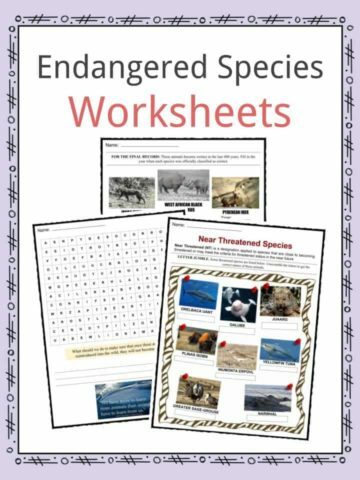 Examples of vegetation include Douglas-fir trees, hemlock, redcedar, and Engelmann spruce trees. 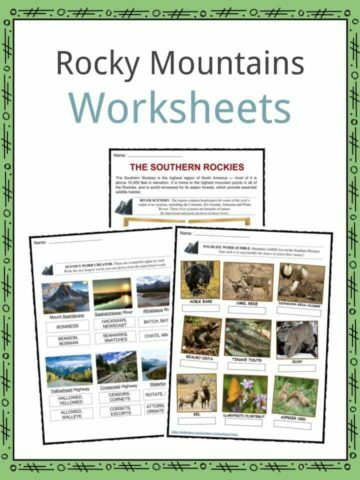 This is a fantastic bundle which includes everything you need to know about Canadian Rocky Mountains Parks across 24 in-depth pages. 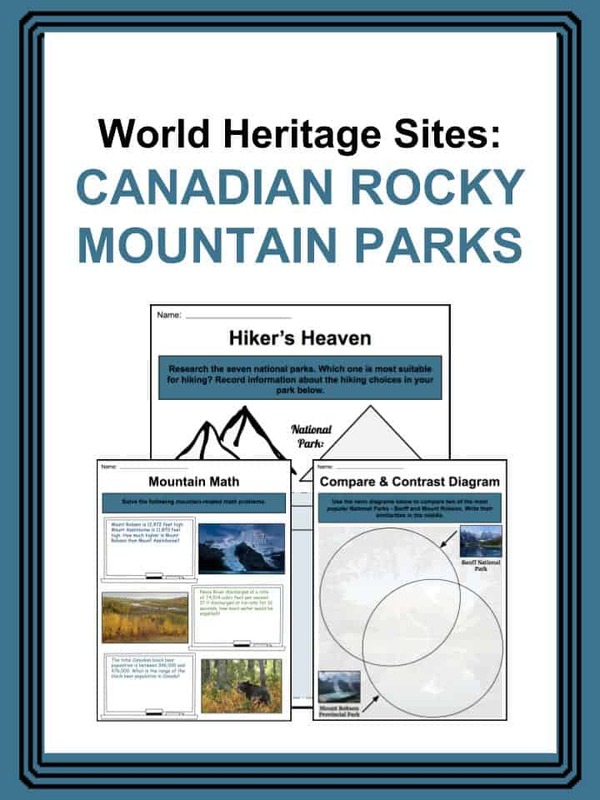 These are ready-to-use World Heritage Sites: Canadian Rocky Mountains Parks worksheets that are perfect for teaching students about the Canadian Rocky Mountains Parks which are a group of seven national parks that are located within the Canadian Rockies, declared together as one UNESCO World Heritage Site. The seven parks are Banff, Jasper, Kootenay, Yoho, as well as Mount Robson, Mount Assiniboine, and Hamber. They became a UNESCO World Heritage Site in 1984. 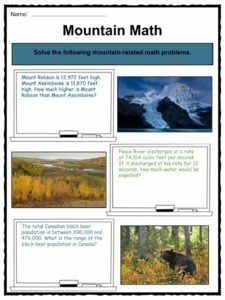 Canadian Rocky Mountain Parks Facts.